The first thing I noticed when I saw the sell sheet for Playoff Contenders this year was the quality of "case guarantees". Being Panini's first year with the product (they bought Donruss) I expected them to do big things with it. They did not disappoint. That is quite an improvement on the break down from previous years, and has the secondary market really active on sealed boxes. The price is already going up on the product one week in, which is generally a good indicator as to how the collectors are receiving the product. The overall design this year is very nice, and is a break from the generic angular designs Panini has been using on their mid-end products thus far in 2009. The cards feature a full body shot of the athlete, with team information on the left hand side. The cards are laid out horizontal, which may go unnoticed by some collectors, but I find it adds to the set. 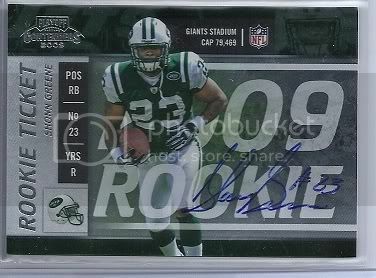 The rookie autos are always a big selling point for Contenders, and are some of the most sought after rookie cards. The initial secondary market sells for these autographs is always fun to gamble with. 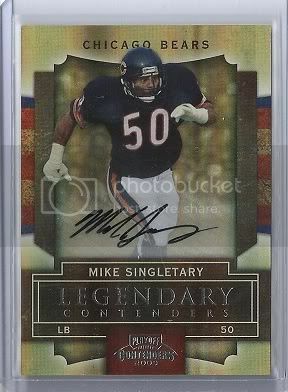 Historically, Contenders has had "SP" (Short Print) rookie autographs in the set. Meaning, some players cards have fewer copies than others. The speculation lasts for a few weeks after the product release, because the print runs are not announced until then. The collecting ability of these short print autographs is extremely high, because there are several set builders out there, but there may be only 75 autos of one player. So if you buy Contenders when it first releases make sure you do your research before putting them on ebay - you may have a short print! This year Panini listened to collectors concerns and has begun the transition (I hope) from stickers back to on card autographs. All of the big name rookies are on card autographs! This is most likely due to the fact that Panini had access to them at the Rookie Photo Shoot back in August. The sticker autographs are nice too though, no holographic stickers, just clear plastic that showcases the ink only. Below is a picture of the Shonn Greene on card auto. The Parallel is either the "Playoff Ticket" numbered to 99 or the "Championship Ticket", which is a 1/1. Of the remaining inserts, only one is numbered in 2009 Contenders. I feel Panini dropped the ball in this respect. Although it's nice to get an insert instead of a base card, there is basically no added value. Now granted the value of an insert /999 and one not numbered will not be that much more, but it is the principal. Almost every brand, except maybe topps, numbers their inserts. However, Panini decided to only number 2 per box. Overall I give 2009 Contenders a B+. It delivers what it promises per case (at least mine did) and the overall quality control and quality of hit is exactly what one would expect to find in a 100.00 box of cards. My guaranteed top 3 player was an on-card auto of Mark Sanchez. My 2 guaranteed second tier players were LeSean McCoy (redemption) and Josh Freeman.